Looks like some good news for Atheists. Stephen Hawking the renowned scientist in cosmetology has made it clear in his new book The Grand Design that he does not believe that God created the Universe. Why ? Well, he seems to say that everything is according to the Laws of Physics. If you say that the Laws of Physics is God, he will agree. But what he is not ready to accept is God as a personality that you can meet. 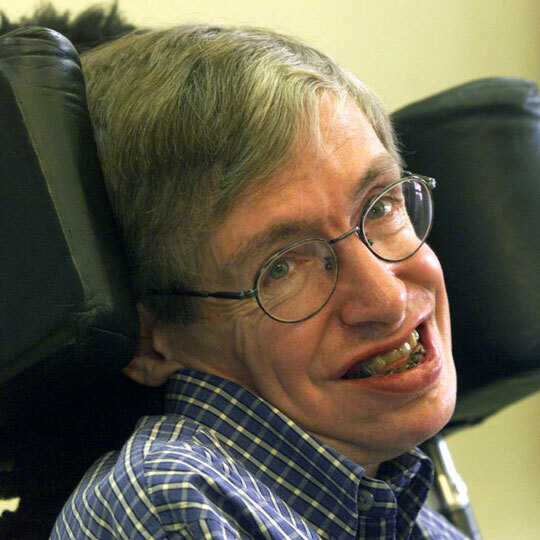 Stephen Hawking does not believe in God? Stephen Hawking once after looking at the complex design in the universe and the mere impossibility of Human existence said that God must be behind all this. Because he thought that the whole process right from Hydrogen bonding after The Big Bang to the perfect distance between the Sun and the Earth to make it suitable for life seems impossible without some force behind it. After a few years he came up with the idea that there might be trillions of universe out there and its just that our universe that turned out to be the perfect universe. body, if we artificial pump his heart and runs agains his other necessary organs. Then please tell me why he does not alive or stand himself again. My answer is only GOD who can give him life again. what is the mystery behind this please ask Dr. STEPHEN HAWKING. The reason why a man cannot be alive again is because once his brain stops working there is nothing that can start it again. But if you look at Stephen Hawking’s views it goes beyond just ‘functioning’ of beings, his views are all about ‘creation’. How it all started is all that matters to him. Sadly, all he found was physics. Lets not criticize him, he is an expert in his field and we have to respect his views. Space is still full of mysteries. Maybe in future Hawking himself will hit something that will help us prove scientifically that an higher being exists. He makes a claim that God doesn’t exist. He says that the laws of physics exist and that everything is a result of such, but because he chooses to make such a bold claim I demand to see the proof. Of course my above statement is meaningless. You could try to prove to anyone anything, even something as simple as the belief that you you exist, and I will show you that you are just as likely in explaining the color blue to a man who’s been blind from birth as to prove anything whatever. I highly doubt that you don’t believe in God Mr. Hawking. You said if the laws of physics were called God you’d believe in Him, but no man would kick and scream at the belief in God (like you have for nearly your entire life) if he himself never believed. You really ought to search harder for what God is before you say that He doesn’t exist. That’s just as ill-minded as me saying I don’t believe in the color blue because all things in this world are made from red and yellow without ever learning the true name for the color blue even though it was always around me and in so many things. Maybe realizing God exists is just like understanding a color that isn’t made from red, blue, or yellow? You can’t understand it’s existence until you witness it first hand. The best quote you had Mr. Hawking: “There is more to wisdom than science.” We can agree on that.